For reasons known only to them, camera manufacturers have, over the years, felt that “cadet” was a good name for a camera. There are at least 20 or so cameras (plus an exposure meter and an enlarger) called Cadets, to include at least eight made by the Ansco company. There’s the Ansco Cadet A8, B2, D6, Flash, Cadet I, II and III, and the Cadet Reflex, for example. 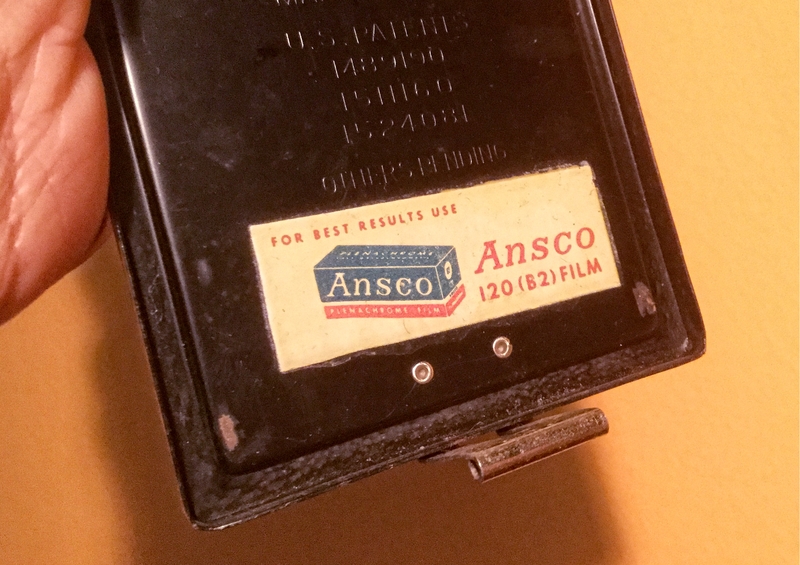 Ansco (formerly the Anthony & Scovill company dating from the 1880s) narrowly avoided bankruptcy in the early 1900s as a result of intense competition from Eastman Kodak, and in 1928, merged with the Germany firm Agfa. As a result, many of its cameras were sold under both the Agfa and Ansco names. The number/letter designations (A8, B2, D6) of its early cameras refer to film sizes, of which there have been many. Today we know film sizes by the designations given by Eastman Kodak, but Agfa’s A8 is equivalent to Eastman’s 127; D6 is equivalent to 116; and B2 is equivalent to 120. Ironically, these are Agfa’s film sizes – Ansco used yet a different naming convention! But the point of this is that the Agfa/Ansco B-2 Cadet takes 120 film, which is manufactured to this day, 70 or 80 years after this camera was on the market. If you forget, a handy little sticker inside the back cover tells you so. Like most box cameras, the B-2 cadet is a simple camera. It has a (useless, really) carrying handle with the name of the camera stamped into it; two viewfinders (allowing portrait and landscape photos), and a lever to operate the shutter. That’s it; unlike some other box cameras, there are no aperture sliders or switches to keep the shutter open. It’s point and shoot, period. 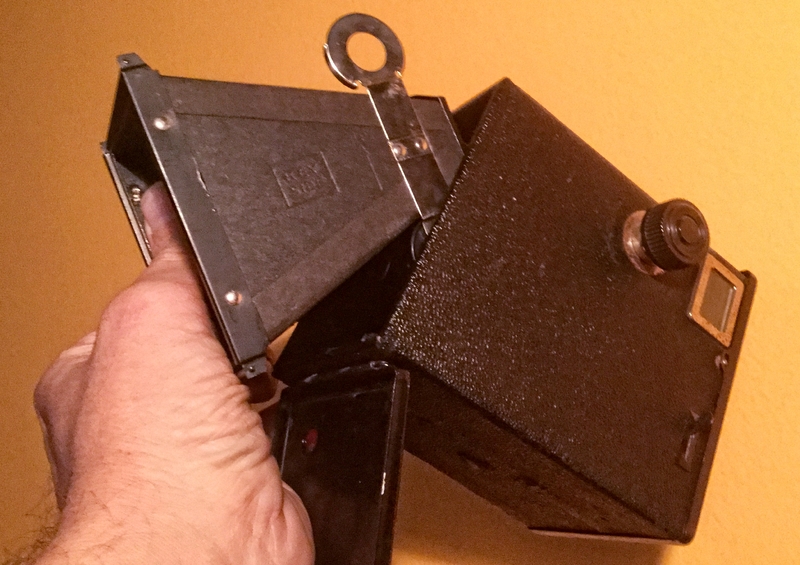 The camera is made out of cardboard, covered in faux leather, with a metal back door and a metal/cardboard inner piece that slides out the back to load the film. I haven’t found any information on its aperture and shutter speed, but for a camera like this to work at most distances, it needs to be about f/11 and 1/50 or 1/60s shutter speed. To load the camera, you simply flip open the back cover, pull the winding knob and pull out the camera’s innards. From there, you insert the film between the clips on the bottom, wind it around the back, and insert the end into the spool on the top. Reinsert, push the winding knob in, and turn until you see the number appear in the small red window at the back. The camera will take 6 by 9 cm photos – eight of them on a roll of 120 film. As mentioned earlier, the carrying handle is pretty much useless – you carry this camera in your hand, and if you want to properly frame a shot, you hold it at waist level in the orientation you prefer, elbows at your sides, look through the (amazingly clear after all this time!) viewfinder, and operate the shutter lever. Done. Although it’s ridiculously simple, taking pictures with the B-2 can still be fun. It’s useful for street photography – nobody suspects this is a camera, so you can walk around town, cast a glance at the viewfinder, and (hold the camera steady!!) operate the switch with your thumb. One note: unlike most other box cameras (as far as I know), the Cadet’s lens is actually behind the shutter. There is simply a hole in the front of the camera through which you see the shutter operate, and you can’t really see the lens unless you look inside the camera. If you come across one of these, it’s wise to clean the lens with a Q-tip and some alcohol, which is easy from the inside, but to clean the front, you’ll have to catch the shutter as it opens and insert the Q-tip that way. Bicycle leaning against the wall. Still one of my favorite pics. If you managed to read this far, I’ll share with you that there was a roll of film inside this camera when it came to me. I developed the film and two photos turned out. This was one of them. This entry was posted in Found Film, Vintage cameras and tagged Agfa, ansco, B-2, B2, box, camera, review, vintage. Bookmark the permalink. I’ve owned two of these – they really can do lovely work within their limitations. And I’ve yet to find one that didn’t need a good lens cleaning! My favorite thing is to buy an old camera with a roll of film inside. A veritable box of chocolates. Found an old Kodak #2 box camera with color pics of an old guy and 2 women (sisters?) fishing, paddle boating, and generally hanging out at what looks like a lakeside state park. Maybe from the ’60’s. Priceless. Same here. I bought a lot of undeveloped rolls as well – people sometimes sell them separately but I like when they can tell me the camera it came from. I did a whole series of posts on the photos that came from this “found film” but I think interest has increased lately, which has driven the prices out of my range. I don’t like paying 23, 30, 50 bucks and then ending up with a blank roll because someone unrolled it or it’s just too darn old. See http://tazmpictures.com/site/?page_id=2152 for more. Six-16 Brownie Special with Found Film?